This wonderful colored photo frame features sturdy structure. 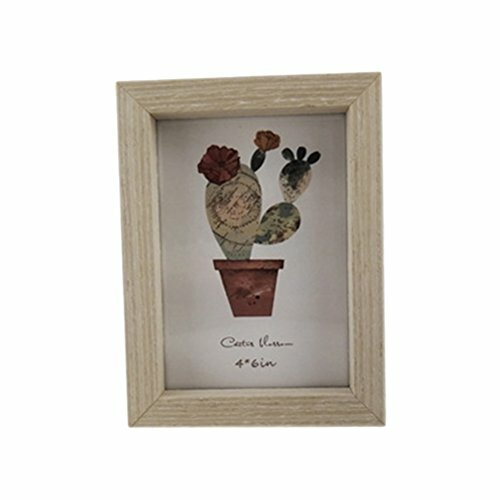 High quality framed art print, American double sized plant specimen photograph frame , add more beauty to you bedroom and living room. Perfect as a gift for family and friends in birthday, anniversary and so on. - Size: Frame size: 12.2x16.2cm; photo size: 10.2x15.2cm. - Made of high quality wood, durable and goodlooking. - American double sized plant specimen photograph frame, record beautiful moments of nature, add more beauty to you bedroom and living room. - You can put your favorite photos into it, and protect your photos. - Great as a nice gift for family and friends in birthday, anniversary and so on. You can put your favorite photos into it, and protect your photos. Made of high quality wood, durable and goodlooking. Great as a nice gift for family and friends in birthday, anniversary and so on. American double sized plant specimen photograph frame, record beautiful moments of nature, add more beauty to you bedroom and living room.